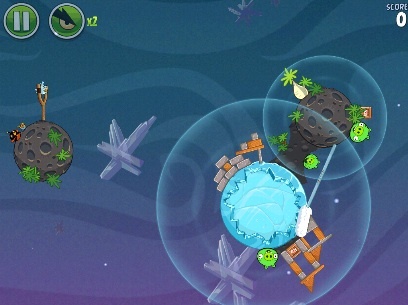 The Flockers explore the universe in Rovio's out of this world sequel. Up until recently, Star Fox's Falco Lombardi was the only video game bird to reach space, the final frontier. Now it seems he'll need to share the inky black with the Flockers, our fine and feathered friends from the exquisite iOS and Android app, Angry Birds Space. Simply put, Rovio has done it again, but on a grander scale. Instead of pumping out the same old levels, ala Angry Birds Seasons and Rio, the Finnish studio took its million selling franchise in a bold and exciting direction. Yes, the basic premise of destroying different structures (and the nefarious pigs within) using a handful of unique birds remains fully intact, but now you have new factors to consider. This time around, you mess with gravity. In previous games, for example, blowing up a wooden hut results in the old saying, what goes up must come down. In Angry Birds Space, this isn't always the case. Unleash a bird towards some objects and watch as they float in various directions. Case in point, asteroids. 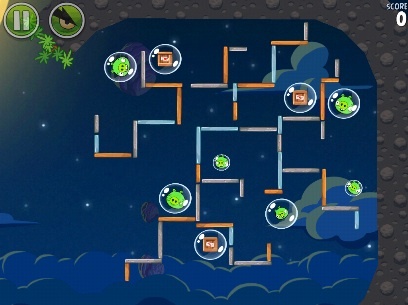 With the Bomb bird, you're able to use the resulting explosion to propel these space rocks towards the pigs, capitalizing on momentum. What's more, you can adjust a bird's trajectory within a planetoid's orbit, curving the normally straight path so the character quickly zips around the planet a few times, moving closer to its surface and eventually attacking a structure at its base, causing it to topple onto those diabolical swine. You can even shoot birds backwards for the same effect, an impossible feat in previous Angry Birds video games. Stuck? Don't worry. The Might Space Eagle (earned through play or purchased in packs of 20, 80, 280 and 980) comes to the rescue, destroying a wide area and taking down pigs unlucky enough to sit in its path. You'll even engage the enemy in the occasional boss fight, once again using asteroids to your advantage. That said, the more things change, the more they stay the same. There's no denying this is an Angry Birds game. You can still earn up to three stars per stage, and despite name changes, most of the birds will be instantly familiar with the exception of Ice Bird, an invaluable companion that turns any hard surface into ice, allowing you to smash right through and kill the sleeping pigs. The only thing we don't like is the in-app purchase for the special Danger Zone levels, a bonus pack of 30 challenging boards that cost an additional $0.99 on top of the $0.99 and $2.99 to download the game for iPhone and iPad, respectively. Considering Rovio's generosity with Seasons, it's a bit surprising to see the company holding out its hand for more cash. At least on the positive side, it's only a buck more, and the game comes with 60 levels. On top of that, there's presumably free downloadable content on the way. That aside, Angry Birds Space is a wonderful addition to the critical acclaimed series, delivering the sort of fresh experience that keeps the IP front and center on the App Store and Android Marketplace. 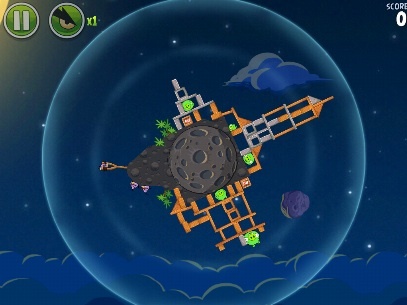 And with DLC incoming, Rovio has a great opportunity to take the space theme to new and exciting heights. Where the company goes from here, though, is anyone's guess. What's Hot: New physics put a cool spin on the proven formula, Ice Bird rocks, 60 stages to enjoy, Mighty Space Eagle for the win, spacey sound effects. What's Not: Paying more for the iPad version, spending an additional $0.99 for the Danger Zone levels, too many easy stages.